Today marks the five year anniversary of the original release of Grand Theft Auto V. It had the biggest launch in entertainment history. GTA V has gone to become one of the most successful games of all time, and its multiplayer mode, GTA Online, has a huge fan base and continues to be updated. After five years, a lot has happened. Let’s take a look back at half a decade of GTA V.
Grand Theft Auto V had years of hype, trailers, screenshots and delays. But on September 17th, 2013, it was finally released for Xbox 360 and PS3. On a personal note, GTA V was the last time I ever stood in line at a midnight release, before digital games and Amazon ended that late night tradition. I’ll never forget that massive crowd gathered around a table of tired Gamestop employees as everybody waited for the clock to strike midnight. With a budget of $266 million, GTA V is still considered one of the most expensive games ever made, but it became profitable almost instantly. It went on to make $800 million in its first 24 hours on sale. That is more money than Ant-Man and The Wasp has earned since it was released back in July. It made a billion dollars in 72 hours, the only entertainment product to make that much that fast. It also broke multiple sales records, including best selling video game in 24 hours. Unfortunately for PC players, GTA V wasn’t released on their platform of choice until March 2015. It ended up having a very successful launch on PC too, estimated to be the best selling game on Steam in 2015. Many folks might not even remember this, but GTA Online didn’t launch until two weeks after GTA V Rockstar has given a few reasons for the delay: It helped the team focus their development resources, it allowed players to relax with single-player and not feel rushed to jump into GTA Online, and it helped players get more comfortable with the gameplay and mechanics of GTA V. But even with a two week delay, GTA Online’s launch was rocky. Rockstar warned players that GTA Online would have a rough start, but the warning didn’t make the first few weeks of GTA Online any better. Players were unable to log in, when they finally did they couldn’t complete the first mission, instead getting stuck at a lobby. Servers were unstable. Characters would get deleted. Progress wouldn’t save. The situation was so bad that Rockstar turned off the ability to buy shark cards during the disastrous launch. Eventually Rockstar got GTA Online working and over the next few months began updating the game with new and free content. Since that, GTA Online has changed and improved a lot: In the last five years the game has received numerous free updates, new modes, balance changes, and more. But at launch it felt empty and aimless; I remember thinking at the time that I didn’t expect to be playing GTA Online for much longer. 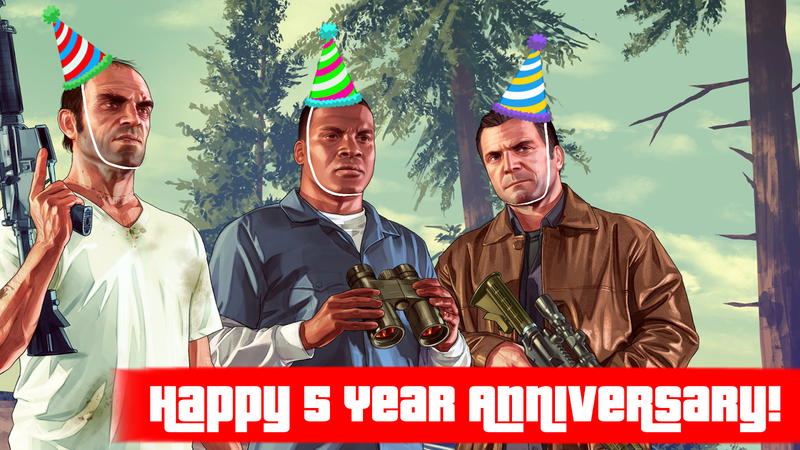 Five years later, millions of other players—myself included—are still jumping into GTA Online every day. In fact, GTA Online is more popular in 2018 than ever before. Once GTA V was in the hands of fans around the world, players quickly began finding easter eggs and secrets. And there were a lot to find: Ghosts, UFOs, sad dogs, Bigfoot, references to older GTA games, and more could all be found in the massive world of GTA V.
But some players wanted more, especially a jetpack. On the top of Mount Chiliad players found grafiti that seemed to reference the jetpack, a popular vehicle from GTA San Andreas. For years after the release players searched everywhere in GTA V, looking desperately for the jetpack. Elaborate theories and rumors were created. An entire subreddit was dedicated to the jetpack and the mystery of Mount Chiliad. While players found new easter eggs during the jetpack hunt, sadly, they never found the jetpack. Eventually Rockstar added a jetpack into GTA Online, but for many it wasn’t how they wanted to unlock that mythical vehicle. GTA fans also began digging into the game to find hidden and cut content. They would end up finding cut missions, unused clothes, evidence that horses were in the game at one point, a removed heist, and old versions of Los Santos. Only a few days after GTA V was released on PC fans were already modding it. Over the months and years since it was released, players have created hundreds of mods. They added a gun that could shoot hundreds of cars a minute, made Groot from Guardians of the Galaxy do some NSFW dancing, unlocked the ability for players to become an animal, let you live out your superhero fantasies, and even turned wind turbines into deadly weapons of mass destruction. GTA V PC players also began using mods to improve the game’s visuals. While it was already a gorgeous and highly detailed game, mods helped make it look even better. Some of these mods made GTA V look nearly like reality. Other modders were more focused on making GTA V more gory and violent. And some modders even added an LGBT parade. But in 2017 the future of GTA V single-player modding was almost destroyed. Take-Two Interactive, the parent company of Rockstar Games, began shutting down popular modding tools like OpenIV. These tools allow players to mess around with GTA V in different ways, like added new weapons or skins. The reason for the shutdown was because Take-Two Interactive was trying to remove cheating software and hacking tools. OpenIV could potentially be used to cheat and hack in GTA Online, even though the tool was designed for use in single-player. The community exploded, and a few weeks later Rockstar and Take-Two relented and OpenIV was saved. But other more nefarious hacking software, much of which players had to pay to use, was shut down for good. Rockstar forced the developers of these tools to give all their profits to charity too. The large open sandbox of GTA V and GTA Online allowed players the freedom to do nearly anything they wanted. You could grab a moped and start doing incredible stunts or try to stop the unstoppable train. Sometimes the GTA V community would become obsessed with something; a great example of this was the way thousands of players tried to blow up a dam in GTA V. The dam is unbreakable, but that didn’t stop fans and YouTubers from doing everything they could to flood Los Santos. Talented GTA fans used the in-game tools to create videos and machinima. A fan used GTA V to create a nature documentary. Another group of fans used the game to recreate the intense tanker truck chase from Mad Max: Fury Road. Some photography-loving players even began taking gorgeous photos inside GTA V. These fans created communities all about photography in GTA Online. A less artistic, but still fascinating subcommunity has been all the biker gangs that popped up in GTA Online. These gangs would create their own recruitment videos and start gang wars with other biker groups. On the complete opposite end of violent biker gangs, some players used GTA V and GTA Online to roleplay as police officers. On console and PC, these players take on different roles, sometimes playing a cop or other times playing a criminal. Discord servers and forums were used to keep track of storylines and past events. One GTA V, a police roleplayer became an overnight sensation on Twitch. GTA Online has also brought people together in the real world. NoClip did a wonderful documentary about the Hillbilly Agenda, a GTA crew that has become one giant family. The crew meets up every year and have a BBQ and party. The leader of the crew, KnoxNerd, even flies across the country to meet members of the crew. Later this year Rockstar games will release Red Dead Redemption II. This is the first major release from Rockstar since they launched GTA V back in 2013. For half a decade now GTA V has been Rockstar’s “newest and latest” game. But that era is coming to a close in October, and I assume GTA Online will see fewer “big” updates moving forward as a new game takes over Rockstar’s attention. Many fans of GTA V will trade in their powerful planes and supercars for horses and revolvers. GTA V won’t be forgotten. The game is still selling incredibly well, with over 90 million copies sold. It has made over $6 billion dollars, or more than all three Avengers movies combined have made at the box office. [Correction 9/18/18 2:37pm—This article originally said GTA V had made more than the entire Marvel Cinematic Universe.] It remains one of the best-selling games every year and has a huge community around it. And while I’m excited for Red Dead Redemption II, I’m not sure it will be able to truly match the success of GTA V.
Zack Zwiezen is a a writer living in Kansas City, Missouri. He has written for Gamecritics, Killscreen and Entertainment Fuse.